The flagrant racism of Donald Trump and his cult congregation of glassy-eyed Republicans and wingnut pundits continues to sink ever further into the abyss. 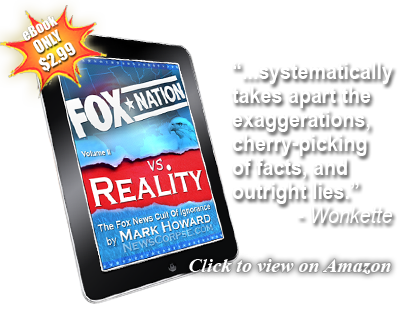 On Friday we saw the repulsive spectacle of a Fox News host, Brian Kilmeade, defend Trump by saying that the kids being separated from their families were just foreigners who we can blithely disregard. “Like it or not,” Kilmeade said, “these aren’t our kids. Show them compassion, but it’s not like he’s doing this to the people of Idaho or Texas.” Get it? This would only be a real problem if the kids were from Idaho. On a day when there are still a couple thousand children being held hostage by Trump’s government, the President held an event at the White House to talk about Americans killed by immigrants. Never mind that there are far more Americans killed by Americans who Trump never bothers to show any sympathy for. Including children at schools like Marjory Stoneman High whose white, Christian murderer is an American citizen. Trump never invited the parents of those victims to the White House. 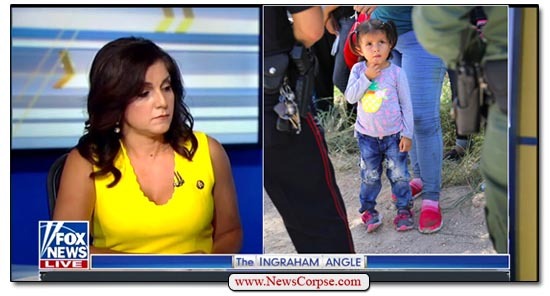 Fox’s Laura Ingraham has been a reliable spokesperson for the cretins who think that ripping babies from their mothers’ arms is a justifiable form of border security. She recently dismissed the thought of any harm inflicted on the immigrant children by saying that their detention facilities were just like “summer camp.” If she attended summer camps like that it might explain how her mind got so twisted and callous. However, Campos-Duffy just proved that not only are some people stupid, they are also nauseatingly heartless. It is mindnumbingly idiotic to compare urban housing to forced internment camps for children stolen from the loving care of their parents. Campos-Duffy apparently cannot comprehend the terror of a lost child who is being held by strangers who provide no comfort or care. That’s the sort of experience that can literally scar a child for life. But Campos-Duffy made another point that she is certainly too dense to notice. She inadvertently pointed out the inhumane conditions at some of the “projects” where low income Americans live. She’s admitting, without realizing it, that those living conditions are extraordinarily harsh and that it is shameful that a nation as wealthy as the United States would permit it. That’s something that is not talked about enough in the media, especially the conservative media that Campos-Duffy calls home. Nevertheless, the comparison is still horribly wrong. To be sure, there are hardships for low income families living in impoverished, and sometimes dangerous, neighborhoods. But they are living there with their families, friends, and other sources of support from the community. They are not minor prisoners in a state facility without parental companionship or security. And the fact that Campos-Duffy and her Fox News cohorts can’t see the difference is a sad testament to their inhumanity. Anyone who supports this sham of a presidency and disgrace to American ethics are worse than Trump…Trump is Trump and will always be configured as such…he has no choice in the matter…but those that have a choice on their stance and still adhere to him are the main issue and problem. Trump keeps them coddled because he entices and caters to their bigotry that only spreads divisive hatred. Nope, you are just an emotionally venerable, dim-witted teenager who understands nothing of governance. The US is in a better spot now than it has been in ten years and you only have Trump to thank hahah. If they want into the country, they can go to the points of entry, otherwise they are breaking the law and OF COURSE they get separated, same way you would if you had kids. You are a prime and shining example why the educational system in the US is close to bottom of ALL the industrialized nations in our world. Trump is resorting to the worst anti immigration rhetoric that has plagued the US for hundreds of years. he does NOT give a crap about the majority of the American people only to his god forsaken base of incredibly small minded and easily led bunch of lemming like, hate-filled, group of bottom feeders. Throughout our history we have villified almost all groups of people who came here for a better life including, the Irish, the Italians, the protestants, the Jews, the Chinese, the Vietnamese just to name a few of the many groups. We have destroyed the Indians and took away their land while relegating them to worthlwess properties where they could not raise crops to feed themselves. You are either so hate-filled or just too damned dumb to be able to undertand anything relating to the dynamics of what is going on in America today!! I am from the UK where our education system far surpasses your own. This is immediately apparent from your infantile, emotional ramblings which you attempt to pass as fact. Your whiney opinion is not a fact kid. “The worst anti-immigration rhetoric”…Pure opinion and subjective BS, I like his “Rhetoric” so what now kid? Also….Now just try to understand along side me here kiddo….ILLEGAL IMMIGRANTS ARE NOT IMMIGRANTS, do you understand this basic technicality you whiney cretin? Probably not. The only small minded idiots exist on the left these days…See TYT and the millions of videos now online of clueless, boarderline retarded teenagers taking to the streets without a single thought in their head. Youtube is the final resting place of the emotional, clueless cretin…like yourself. I understand your anger but try dealing in reality. I understand you live in a utopian bubble, but in the real world the US is probably the greatest nation on earth with not only economically but socially, again your soft and malleable brain has been polluted with ease and now you exist in an eternal emotional state of ignorance. You understand NOTHING about world history, governance or politics…You just whine and cry like a little baby about your subjective, and objectively retarded opinions. Again the only hate filled one is you, enjoy your “resistance” LOL. The rest of us are trying to make the country a better place. Another sheep in the heard, be gone idiot. All you have done is reveal how little you know about current affairs or the technicalities about whats going on. I enjoy how I am soooo stupid yet you couldn’t refute a single factual point I raised in my previous comments? Oh so very amusing, please don’t reply…reading this comment hurt my head. You want someone to respond to your previous (ignorant, racist) comments? OK.
That’s false. Most of the families being separated are asylum seekers who presented themselves to law enforcement authorities at the border. That’s a legal process, so they broke no laws. Most of the rest are being prosecuted criminally by this administration when previous administrations (Democratic and Republican) treated them as civil violations. That prompted the horrendous human rights abuses of family separation. That’s false. No one has ever asserted that. It’s just a racist canard intended to insult the people who care about human rights, and to dismiss the heinous policies of this administration. That’s false – and really stupid. Only citizens can vote. And even with a pathway to citizenship for immigrants it could take up to 20 years before they are eligible. There has been almost zero incidents of undocumented residents voting. Even Trump’s commission on the subject couldn’t find any. Finally, your relentless whining and insults say much more about you than the compassionate people you criticize. And the irony of your allegations of ignorance and stupidity is that apply much more obviously to you. Worst of all is your support for family separation which even Republicans, including Trump (if you can believe anything he says) oppose – along with the vast majority of Americans. You are in a minority that is very much like the Nazi regime that engaged in similar activities. My god you pathetic losers are so dim-witted to the rules of governance it is truly frightening. Dems use illegals for votes and that’s all this is haha the Dems, historically, the most racist party on earth. ross…it just appears that ya think that you are the little boy with the big britches; keep wearing ’em. You also stated that ya are an immigrant as well from the UK, so welcome aboard. Funny though how ya can’t relate to those immigrants that are seeking asylum from brutal conditions in their homelands. 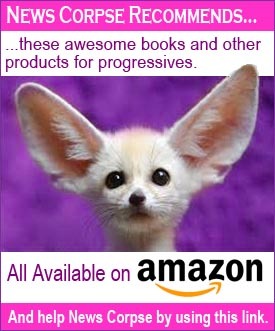 But if ya truly want to debate substantive facts…fire away cowpunch, for you as of yet haven’t given any truths preferring instead to merely spew out nonsense. Besides, ya don’t know me and can’t categorize, but you, in campaigning for Trump says quite a bit of who you are. White supremacist groups not only voted for Trump they all endorsed him and for good reason…he gives them recognition. The so called ‘witch hunt’…why, when it was announced in the Russian parliament that Trump had won…they all stood up, clapped and cheered…never before though for any other U.S. president…just for Trump. There is a connection there. Amazing how many disturbed people goose step to Trumps chants and voom doo politics! Amazing how many dim-witted, clueless teenagers will make hilarious and ridiculous comparisons to the Nazi’s. And you had the nerve to comment on my education hahahaha idiot. Because it is comparable in a sense to what the Nazis had done. On another note, a better analogy would be the internment of Japanese-Americans during WW2. I don’t know if you’re from the UK or whatnot, but it’s clear that you’re a good example of how things like xenophobia are not exclusive to any one country. You’re also a great example of how hate blinds one to all other things. You still don’t realize that this entire issue was caused by Trump’s “zero tolerance policy” and that if he were to simply reveres course on it (and seek to reverse the damage it has already wrought), it would no longer be an issue. But he doesn’t because he and a=others like you, LOVE it for the cruelty that it inflicts. Best of all this highlights the selfishness of Trumpians like yourself, because we all know that you wouldn’t be cheering if the same were to be happening to you (of course, you’re able to take your current arrogant stance precisely because you believe such will NEVER happen to you, well all I can say is, good luck to you if it ever does happen to you). Those who are for Trump need to think long term. Meaning that he could put people who live in the US into internment camps, if he wants to bc the GOP back him 100% . Scary, but that’s his mentally. Fee people know that the ONLY reason he is bending a tad is because one of the Koch brothers stepped in & told the GOP & Trump to stop taking children from their parents. We are a country that is becoming just like South America where the the super rich run the government & there are only two classes of people-the extreme rich and the extreme poor.